LiveOps Reviews - Legit or Scam? LiveOps Reviews – Legit or Scam? LiveOps, at www.LiveOps.com, is a national call center that provides work at home opportunities to those who qualify to be one of their independent agents. They provide the flexibility of your own business with the stability of traditional employment. LiveOps operates a virtual call center which employs over 20,000 sales and customer service professionals. These professionals are independent contractors, who act as their own boss, set their own schedule, and choose where and when they work. In addition, LiveOps provides their employees with a community of other independent agents they can talk to for advice or support, as well as extensive tools and resources to help their employees with various problems they may encounter. Anyone can work for LiveOps, as long as they meet a series of minimum requirements. First, LiveOps does not provide any equipment for you to perform your work duties, so you must be able to provide the following. You’ll need digital landline phone service provided by AT&T, Verizon, or Comcast, as well as a corded telephone and a corded headset compatible with that phone, in addition to DSL or cable modem wire connection to the internet; wireless connection not allowed. Finally, you’ll need a desktop computer or laptop with a 1 GHz Intel Pentium P4 Processor, computer speakers, and a printer. 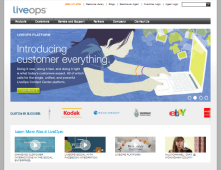 You’ll also need to meet a wide variety of software requirements, which are laid out in detail at LiveOps.com. You will also need to complete a credit check and a background check. There is a fee for the background check, which you must pay, but understand that money goes to a third party service, not to LiveOps. LiveOps cannot give estimations of earnings, as earnings depend completely on the clients you work with, how many hours you work, and the volume of calls you handle during that time period. Some companies pay a flat rate, such as 25 cents per minute of talk time, while others pay a flat rate plus commission, and still others only pay commission. You can choose which companies you prefer to work with. LiveOps cannot hire you unless you successfully complete their certification process. This process can be completed within a week, and have you working with clients in no time.